The digital edition of the magazine is also available for subscribers to view online or download to a device. Want to use your iPad, tablet, or smartphone? Please download the MBHH app from the iTunes App or Google Play stores. Subscribers will need to use their email address and account number to log in. Questions? Visit our Digital Edition FAQ page for access details. Click Here to get the best of coastal Maine living. If you like nice boats, you might also like this vintage Porsche, a 1960 356 B Roadster. One of the more intriguing sailing yachts launched this year in Maine is the 72-foot sloop Toroa, built at Brooklin Boat Yard. An expansion of builder Bertram Frost’s yard, Jonesport Shipyard has become an all-in-one stopping point for both pleasure and commercial boaters. Old timers in Lubec remember the days when the coastal economy revolved around sardines. The man: a 64-year-old real estate agent. The challenge: row 125 miles from Cape Cod to Portland, Maine, in 72 hours. Did he make it? Read the story! Thousands of years ago a mysterious people, known for the red powder found in their graves, lived on the Maine coast. An archeological site on North Haven provided clues about their culture. There’s a reason why Hinckley Bermuda 40s remain in high demand even after decades of use: they are versatile, capable, and elegant. After building many fine homes for others, this contractor knew just what he wanted when it came time to build a house for himself. Alexandra Tyng finds inspiration for her paintings by looking at the landscape from the air. Research for a novel takes an author out to sea in search of lobsters and understanding. A trip back in time to Lunenburg, Nova Scotia. Tis the season of hibernation, snow and ice, and quiet reflection. A Dark Harbor 17 and a NY 40 tango at the 2017 Camden Classics Cup race. Three days of handcrafted products on the Rockland waterfront. A look back at the St. Croix paper mill settlement of the early 1900s. Coastal scenes from photographer Dan Bookham. Video: We print stories about other people’s homes and boats, now it’s tell time tell you a little bit about us. MBH&H is based in an historic building in Rockland, Maine, with views of the harbor. We were curious about the part of the view that we cannot see and partnered with our friends at Compass Light Productions to produce “Underwater Rockland,” a really cool short video. Watch it now! Tribute: Meade Gougeon (1938-2017) helped revolutionize boatbuilding. Learn more about Gougeon, his innovations, and his boats. Advice: Are you considering renting out rooms on your boat? A maritime attorney has this advice. Art Exhibit: Take a look at the Penobscot Marine Museum’s new Fitz Henry Lane painting. Happenings: MBH&H sponsored Rockland’s first ever People’s Sculpture Race during the 2017 Boat and Home Show. Check it out! History: Folks at the Maine Maritime Museum in Bath are restoring the Mary E, one of the oldest Maine-built fishing schooners still afloat. Follow their progress. Click the cover image above to view the digital edition online. 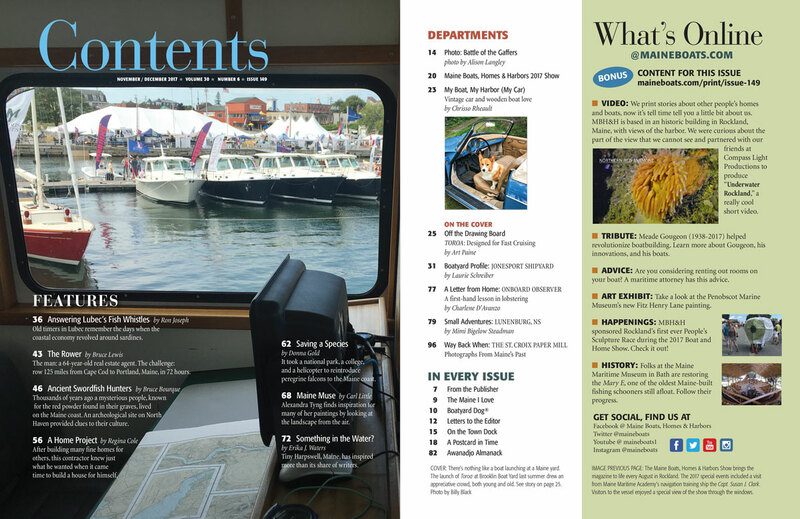 On the cover: There's nothing like a boat launching at a Maine yard. The launch of Toroa at Brooklin Boat Yard last summer drew an appreciative crowd, both young and old.